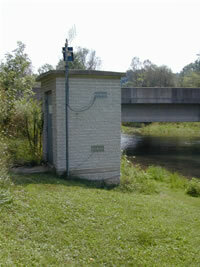 LOCATION.--Lat 40`53'23", long 77`47'40", Centre County, Hydrologic Unit 02050204, on right bank at upstream side of bridge on SR 3001, 1.6 mi west of Axemann, 1.8 mi southwest of Bellefonte, and 2.5 mi upstream from Logan Branch. GAGE.--Water-stage recorder and crest-stage gage. Datum of gage is 788.81 ft above National Geodetic Vertical Datum of 1929. Prior to Nov. 19, 1940, non-recording gage at same site and datum. Non-recording gage Mar. 6 to Sept. 30, 1995.